For today’s blog we will finish our discussion on the 8 attributes of discipleship based on the book, Transformational Discipleship. Building Relationships and Unashamed are the 7th and 8th attributes identified in our research. These final two attributes are critical as you engage your students in the discipleship process. Attribute #7: Building Relationships – Paul wrote to the church at Philippi, not to allow selfishness, ambition, or conceit, but to look out for the interests of others as more important than our own (Philippians 2:1-11). Not out of a sense of self-deprecation, but a spirit of humble imitation of what Christ did for us. Similarly in Matthew 22, Jesus told us that all of the law and prophets’ teachings could be summed in two commands: Love God with all of our heart, soul, and mind, and love our neighbor as ourselves. We serve a God who lives in community with Himself, and made His creation to live and function in community with Him and each other. Our faith is personal, but not intended to be private. Christ designed the church to not only share the gospel with a lost world, but to support and care for one another while on this mission. As a student’s relationship deepens with God, they should be developing relationships with those around them. Transformation is occurring when relational maturity is evident in a student’s life. Often proximity is confused with community, but just because students attend a small group doesn’t means that they are building relationships and living in community. We must teach students that building lasting relationships means sharing both victories and struggles. All through the book of Acts and the New Testament, we see the church and its leaders not only sharing struggles with one another, but also rejoicing and sharing their lives with one another. We must show students that building relationships means developing transparency, not simply giving the right answer and keeping their lives private. Building relationships means seeing our own sin and the sin of others through the humility of Christ, not the suspicion of comparison. When students are building relationships their faith doesn’t simply stay constrained to a roundtable discussion once a week, it begins to work its way into your students daily lives. When students are truly building relationships, the fruit of community is evident. It must start with student pastors and leaders before it impacts the lives of the students they lead. Attribute #8: Unashamed – It’s natural to think that someone following Christ will be willing to share their faith with the world around them. During the research of the 8 attributes believers felt it right and necessary for others to know them as Christians and be held accountable for a life connected to that name. Transformation is evident when a believer is unashamed in presenting their own life as being aligned with Christ. Students who are unashamed of their faith see the why for their faith, not simply the what. Paul shows us this in the familiar passage of Romans 1:16, “For I am not ashamed of the gospel, because it is God’s power for salvation to everyone who believes…” Paul is unashamed of the gospel, why? “Because it is the power of God to everyone who believes.” When a believer not only understands what, but understands why it is so critical, it grows boldness, courage, and a desire to publicly associate their lives with Christ. This can be seen when students find themselves more excited to talk about their relationships with Christ than their Xbox, clothing brand, or any other facet of their lives. We must be intentional about creating disciples who know why their faith is so critically important. As we disciple students, if we aim at everything we will eventually hit nothing, and if we aim at nothing, I’m afraid we will hit it every time. At the very heart of Christianity is the work of making disciples for Christ. It should never sit at the fringe of our life or student ministry. 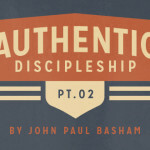 As we have looked at these 8 attributes of discipleship, we are able to better recognize when we are effectively reaching toward the goal of developing authentic disciples. This week on the blog we’ve walked through the eight attributes of discipleship that indicate spiritual growth in the lives of believers. These eight attributes are also the foundation of the new Bible Studies for Life: Students. Each session of Bible Studies for Life: Students emphasizes these attributes throughout its three year scope and sequence. Using God’s Word, solid discussion, heavy interactivity, and a deep plan to live out each session, Bible Studies for Life: Students seeks to connect God’s Word to your students’ lives in an intentional way, using the 8 attributes we have discussed. If you would like to preview Bible Studies for Life: Students for free, click here.